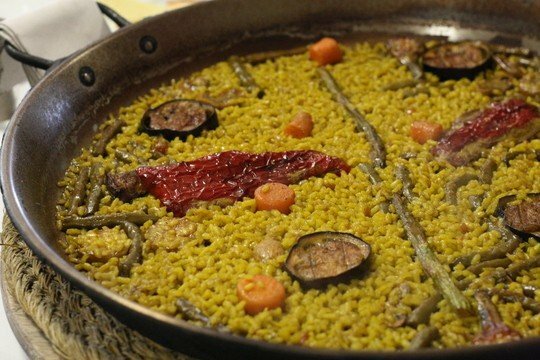 A delicious and easy Spanish rice dish. 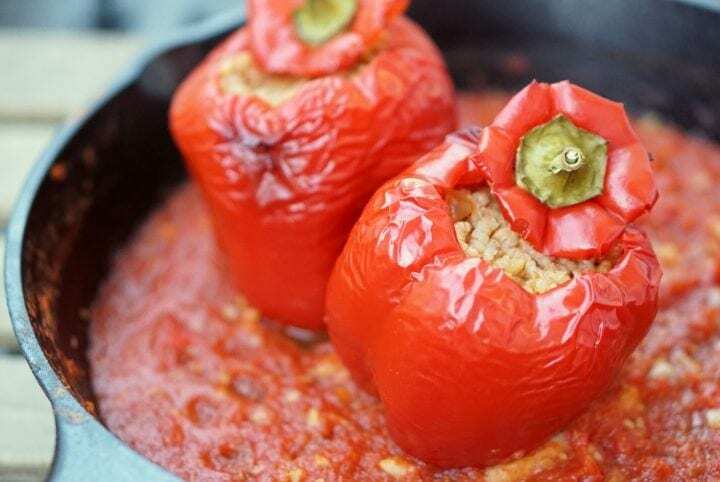 While I’ve never fallen head over heels for Spanish rice dishes like paella, there was something about a recipe for baked rice with garbanzos that caught my attention. I’m a big fan of vegetarian Spanish rice recipes, and I adapted this one from the fantastic Claudia Roden Foods of Spain cookbook. I added a few small twists to make it even more delicious (in my humble opinion!). The best part? It’s super easy and really pretty– aka perfect for company. It’s also vegetarian friendly and pretty healthy. 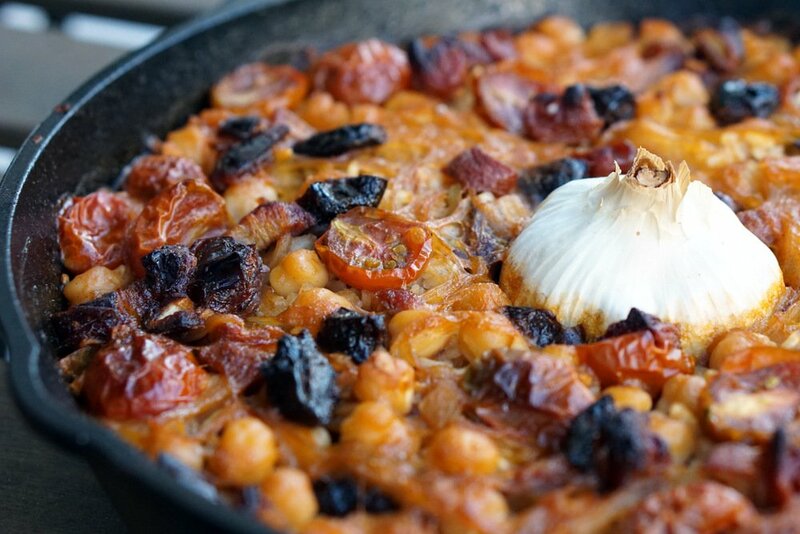 A easy and delicious baked rice recipe with garbanzos and dates. Vegetarian friendly and ready in an hour! In the meantime, place the almonds in a hot frying pan (with a touch of olive oil if you wish). Sauté constantly until browned. Don't let them burn! Top the finished dish with the toasted almonds and enjoy. Delicious, right? Let this baked rice with garbanzos and dates grace your dinner table this winter and everyone will be happy! Kitchen tip: Pre-soak dried garbanzos for 24 hrs, drain and freeze. Whenever you need the beans, all you need do is cook the required amount for 30-40 minutes. No more pesky cans. Sounds great Frank! And they’re so much better– but sometimes the jars are a lifesaver. Sometimes I wish I lived in Catalonia, there the local markets sell cooked beans of all sorts. Basically someone else does all the work for you! I like in Spain that they have the smaller garbanzos too (los garbanzos de pedrosillano). This looks fabulous, Lauren. Perfect for the new, cooler days. I’ll be trying it soon. Thanks! I was drawn in by the photo – and that amazing clove of garlic in the middle! Made this tonight with ham and mushroom, plus the prunes, onion, etc. (Doubled the pimientón with a tsp each of De la Vera dulce and agridulce since didn’t have any chorizo on hand.) Baked it all up in my 15″ paella pan at 375°F and 30 min. Also baked it with the cut garlic head turned upward so that we could serve roasted garlic on top along with the toasted sliced almonds. The flavors turned out so intense and earthy. Next time we’re going to put like two or three heads of garlic in the pan and raise the chopped prunes to a cup. Thanks for the inspiration! A nice change up from paella. So glad it worked out! Sounds delicious! Hi Lauren! I am going to make this dish and I have a question. As I understand, the recipe says to put uncooked rice in the oven. Does the rice cooks through well in the oven? Or I misunderstand something? Hi Irina, exactly– the rice was added to the pan and stirred into the stock. Since there in enough stock the rice will fully absorb that and cook during the half hour in the oven! Good luck, hope it turns out great! I used a 10 inch cast iron, but go ahead and experiment– the layer of rice will just be thinner (which I actually love) and cook time might have to be slightly adjusted.